Sean Michael Kerner seemingly declares death for Novell Market Start in this new article about a particular business model which failed not only in Red Hat’s case; Novell too never saw it taking off. In 2007, Red Hat launched an effort called the Red Hat Exchange (RHX), a marketplace for selling open source solutions from Red Hat’s partners. RHX was in part Red Hat’s response to competitive pressure from the Novell Market Start program. This is okay. Free software is operational and obtainable even without centralisation under another umbrella which is a company. 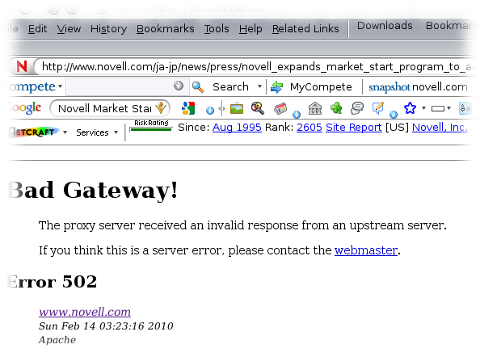 We wrote about Novell Market Start in [1, 2, 3]. Michael Meeks, the Novell Inc. developer who launched the Go-OO branch of OpenOffice.org, is pessimistic about JavaFX, saying its semi-proprietary licensing is an obstacle for the open-source app, and it poses other technical problems. That sounds like a better description for Mono and Moonlight. Meeks puts the demands of his employer before personal responsibility as a GNOME hacker and he is responsible for forking OpenOffice.org, a move which was unhelpful [1, 2, 3, 4, 5, 6]. In the next post we will show that Novell aggressively promotes .NET, which competes against Java. We will also show that Novell is a big fan of Silverlight developers, to whom JavaFX is a direct threat. According to this report from Heise/The H, screen lock functionality in OpenSUSE/GNOME is inherently broken and the problem gets confirmed. The screen lock of openSUSE 11.2 can be bypassed by the simplest of means. A reader’s report prompted The H’s associates at heise Security to investigate. Tests confirmed that a locked desktop session can be unlocked without password by holding down the return key. This causes the GNOME screen saver to crash and unlock the desktop after only a few seconds. Liferay has just joined Novell’s equivalent of Red Hat Exchange, following another recent inclusion. This comes amid more reports on expected acquisitions, which as we have mentioned before, are likely to involve proprietary software. These different development show that Novell continues to cling onto its proprietary software roots rather than truly advance into future business and development models. Elsewhere in the news we see NetWare losing its appeal. In Australia, for instance, NetWare is being replaced by GNU/Linux. As part of a core infrastructure refresh project, The NSW Department of State and Regional Development (DSRD) will ditch its legacy NetWare systems in favour of the open source Linux. There is further confirmation in ComputerWorld, which yesterday described NetWare as a dead/dying skill. In the early 1990s, it was all the rage to become a Certified NetWare Engineer, especially with Novell Inc. enjoying 90% market share for PC-based servers. Today, however, you don’t have to look far to find CNEs retraining themselves with other skills to stay marketable. “It seems like it happened overnight,” Hayes says. “Everyone had Novell, and within a two-year period, they’d all switched to NT.” Novell says it will continue supporting NetWare 6.5 through at least 2015; however, it has also retired several of its NetWare certifications, including Master CNE and NetWare 5 CNE, and it plans to retire NetWare 6 CNE. “Companies are still paying skill premiums for CNEs, but they’re losing value,” Foote says. Novell still seems to be struggling internally to define itself and its own philosophy, first embracing and then recently retreating somewhat from Open Source, preferring to categorize themselves as a "mixed source" company. Recently, Red Hat announced the Red Hat Exchange (RHX) program, an online marketplace for open source solutions. Well, Novell’s Bruce Lowry wants to remind us of Novell’s long-standing effort in this area, Market Start, and detail some recent additions to the program. Anybody who had any doubts about whether open source has the power to go beyond operating systems and other infrastructure roles need look no further than this list of Novell Market Start partners. Together, we’re making it increasingly easy for customers – big and small – to tap into the flexibility, cost benefits and performance power of open source. Lowry’s outlook and attitude towards open source seems markedly more positive than that of Stafford Masie, appearing at the CITI Forum shortly after the announcement of the Microvell deal. We believe today alot of the open source technology has not caught up yet to enterprise customers’ needs in the security domain, management domain. Where Linux is open source, specifically Linux is completely applicable is the platform, the desktop, office productivity suite, the database, etc so there’s kinda 5 major areas where its good enough if not better than whats out there, ok? where its not there yet, Novell has proprietary technology and partners that provide 3rd party technologies to that proprietary technologies where we wrap our technologies around this Linux technology. so, like zenworks management, our zenworks management suite is a proprietary piece of technology. So, which is the real Novell?